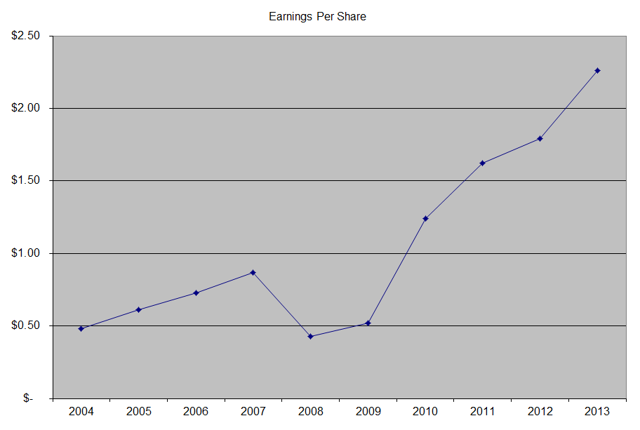 The company has managed to deliver a 20.60% average increase in annual EPS over the past decade. Starbucks is expected to earn $2.69 per share in 2014 and $3.16 per share in 2015. In comparison, the company earned $2.26/share in 2013. Starbucks has a strong brand name, synonymous with quality, customer service and a unique atmosphere at its stores. The company also gains from benefits of scale as it expands its retail store footprint globally. Future growth for Starbucks will be delivered by expanding the number of stores globally. While the US market is close to being saturated in terms of store count, there is plenty of room for growth in countries like China, India, Brazil. The company can also squeeze in more growth from existing US stores by adding drive-through windows and extending store hours. The international expansion can be aided by replicating the best practices of stores in the US and then replicating success abroad, one store at a time. The benefits to scale relative to other coffee shops is adding to the company's bottom line. In addition, the strong brand and unique customer experience have translated into pricing power for Starbucks. Hence, I believe the company to have a wide moat. In addition, Starbucks is actively diversifying its revenues by expanding into other channels, such as K-cups, packaged coffee, etc. If Starbucks could further leverage the company's brand by selling a variety of branded consumer goods at mass retailers, it could further grow revenues and profits. The company would likely be able to open approximately a net number of 1,500 stores annually over the next decade, thus bringing store count closer to 35,000 units globally. As a result of store count increases and estimated increases in same store sales, it is quite possible that the company will be able to grow earnings per share by close to 12%-15%/year over the next decade. I also like the company's management, in the face of Howard Schultz, who has the majority of his net worth in Starbucks stock. Given the fact that he is only 61, I believe he has at least a decade before he contemplates retirement. Even if he were to step down, I see him as still being involved in the future of the organization. As a side note observation, it is very interesting to see how owner operators of publicly traded companies tend to monetize their passion for the business they manage into outstanding total returns for shareholders. The company initiated its first dividend of ten cents/share in 2010. Since then, the dividend has been increased four times, with the latest quarterly dividend payment being of 26 cents/share. Since Starbucks is still in the initial phases of dividend growth, it can afford to grow distributions at a much higher rate than earnings growth for several years. Once it reaches a certain target dividend payout ratio, however, dividend growth would likely level off and grow as much as earnings per share over time. 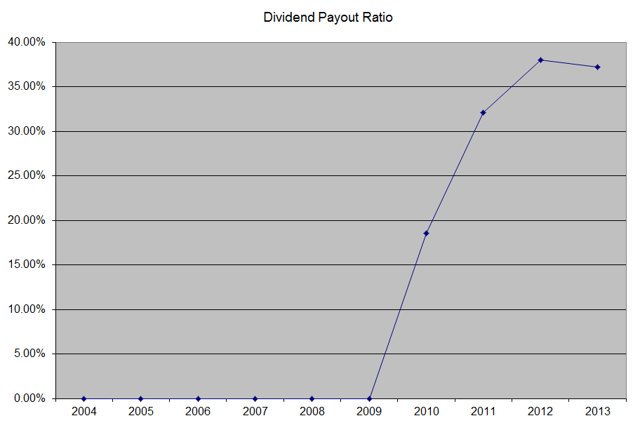 The dividend payout ratio is around 37% right now. I believe that even with a dividend payout of 40%-45%, Starbucks would still be able to plow back enough into the business and still achieve its growth targets over the next decade. At the forward earnings of $3.16/share for 2015, and at a 37% dividend payout ratio, I would expect that the company Board of Directors to increase quarterly distributions to 29-30 cents/share at their next announcement. Starbucks has a high return on equity at around 30%. A high return on equity is usually one of the signs of an outstanding business, which generates hefty returns above its cost of capital. The ROE declined during the financial crisis, but bounced back after Howard Schultz returned to the company to lead turnaround efforts at the chain. 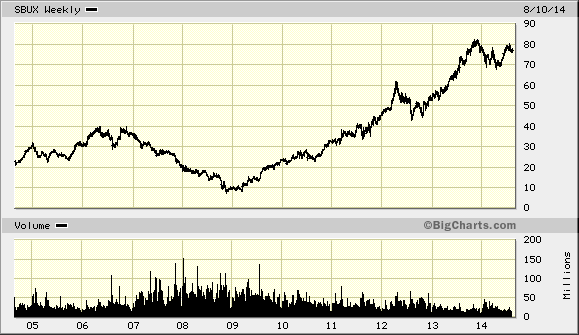 Currently, I find Starbucks to be overvalued at 28.70 times forward earnings and a low yield of 1.35%. Starbucks is a growth company, which will likely grow earnings per share by 12% - 15%/year over the next decade, which somewhat justifies the low yield and optimistic valuation. Unfortunately, I cannot get myself to pay more than 20 times earnings for a company, because I know that things could go wrong to derail even for the best crafted plans. If the company stumbles, or if stock markets finally decide to cool off a little bit during the next bear market, that would be the best opportunity to acquire a stake in this otherwise fine company. The third option for me would be to sell a long-dated put with a strike as far out as January 2016 with a strike of $70, earn a premium of $5, and pay an effective entry price of $65 per share if called out. If not, and the stock price explodes from here, I would at least earn some premium.